Diane, it was from lots and lots of sewing. Particularly, sewing from 1940s patterns that also used ruching but instructed the user on proper finishing. When you do start sewing, I really do like the way the pattern turned out (with my tweaks). This is why I stopped making dresses. The patterns were not helpful enough or just plain wrong! My skills were not up to yours and I just did not know enough "fixes". Thank you, Anna, I have this pattern but haven't made it yet. Appreciate your expert sewing advice!! Please do show the finished product. I have this pattern but haven't attempted it yet. Thank you. Dottie Angel first became well known for her bohemian style creativity - sewing for herself, and has transitioned into pattern making without a background of formal training in it, as I understand. It's a little surprising to find her working for Simplicity. I'm not sure if she, or a behind the scenes pattern maker is responsible for taking her idea and sending it out into the world as a dress making pattern for the masses. Like you, I probably have enough sewing experience to make my way through to a properly finished garment, but many wouldn't, which makes selling it seem unfair. So glad you persevered and are happy with the end result. That's a lot of corrections from a bought 'professional' pattern. I hardly ever look at instructions because my Grandmother and Mother taught me their tried and true methods of sewing and I have found often pattern instructions to be seriously lacking. It does make me wonder how beginning sewers manage to learn. 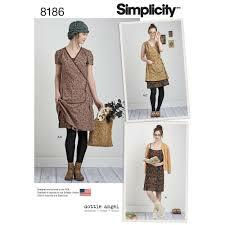 I would also be very interested in your best patterns for a wrap dress. I remember you doing a post of your favourites a while back, would you still say they are your favourite dresses to wear? Which ones did you blog about that didn't wear very well? Please do tell so we can all learn from your sewing experiences. Lisa, I agree completely that it isn't necessary to understich the bias when it is being topstitched down. It doesn't help hold the bias once the topstitching is completed. I'm very sorry if my comment wasn't clear and I didn't intend to contradict Anna's experiences with this pattern at all. I just personally find it easy to understich and by doing so the bias binding nearly always folds under nicely, creating a nice finish without wrinkles or having the bias showing through on the right side. But that's just my personal experience whereas before learning this technique I would avoid bias finished edges because I often struggled to get a nice finish. And I'm sure every sewist (myself included) learns valuable lessons by making mistakes and quickly becoming great friends with the quick unpick. It's the journey of learning and continuing to develop skills in our hobby/craft/art which is rewarding.